Rethink Disruption explores breakthrough technologies that are poised to transform existing markets. Disruptive technologies can give an enterprise a competitive advantage over its competitors – if business leaders can find their way through a confusing array of new ideas and techniques. 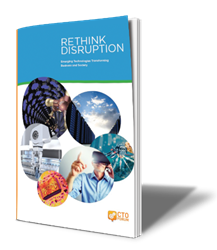 The CTO Forum, a premier organization for senior technology and business leaders, today announced the release of the third volume of the Rethink Disruption eBook. This complimentary publication illustrates in detail the top emerging technologies that are truly poised to transform business and society as we know it today. "Disruptive technologies can give an enterprise a competitive advantage over its competitors – if business leaders can find their way through a confusing array of new ideas and techniques. The right decisions take the business to the edge where it can be a market leader. The wrong decisions on the other hand can have disastrous consequences," said Basheer Janjua, Founder and President of the CTO Forum. Rethink Disruption is a great resource for all who are eager to learn from world-class industry leaders who share their best ideas for harnessing these new technologies to stimulate business growth and revitalize the economic prospects. This publication comprehensively addresses the latest technologies that are positioned to create significant impact and disruption in material science, computing, digital life, robotics, manufacturing, and semiconductor. The eBook features renowned experts, innovators and thought leaders such as Jeffrey Welser of IBM, Philip Rosedale, Rich Mahoney of SRI International, Paul Boris of GE, Ivo Bolsens of Xilinx, Robert Burgelman of Stanford University and others. Readers will delve deeply into the breadth and scope of opportunities presented by the breakthroughs in engineering, science and technology and learn how to recognize the latest forces poised to transform existing markets. Rethink Disruption is available now for free download here.